Fans of the BBC series Top Gear will enjoy this new companion book. Where's Stig is a picture book based on the popular "Where's Waldo" books. The white-clad, white-helmeted The Stig manages to lose himself in 12 different Top Gear inspired locations, including the Studio, Tokyo, the Deep South and the English Channel. In addition to trying to find The Stig, there is a list of other things that you can look for in each location, including his colleagues Jeremy, Richard and James. At the end of the book there is also a checklist of things to look for specific to each scene. The illustrations are very colorful and humorous, and contain jokes and other elements that fans of the show will surely recognize. While this is a picture book, it is aimed at adults. There's nothing really offensive contained, but it is not a children's book. If you are a fan of the series, you will find a lot to engage you in this book. Even if you've never seen Top Gear, you'll enjoy the illustrations and the challenge of trying to find all the elements! Thanks to Warner Bros., I have one copy of the book Where's Stig to giveaway! To enter, please leave a comment stating your favorite location to "lose yourself." Please be sure your email address is in your comment or in your profile (if you have a blog) so I'll have a way to contact you. Open to the US and Canada. Contest ends on Oct. 28. 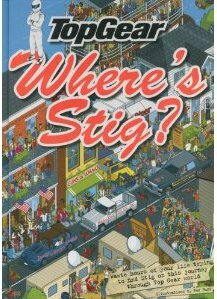 Disclaimer: I was sent a copy of Where's Stig to give away by Warner Bros. I love losing myself at the dog park! I like to lose myself at the library! Since I don't actually get "away" very often I will loose myself in a good book for video game. I like to lose myself in a bubble bath! I would love to lose myself in Cleveland, Ohio. I know, not everyone's pick, but I'm homesick! I love "losing" myself on the Bruce trail. It's a huge hiking trail that would take you weeks to walk from one end to the other, but it's nice to head out on it for the day every once in a while. waterfalls, birds eye view of the city, deer (probably the only place deer can live in the middle of our city). It's so nice. My favorite place to loose myself in at a Mall...lol...I love the Where's Waldo books...I'm sure I would love this book also. On my patio is the best place for me with my book and dogs around me.